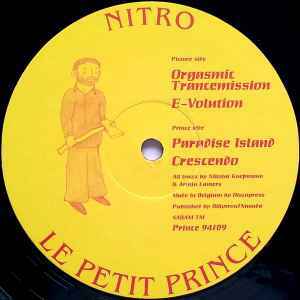 "Orgasmic Trancemission" is a classic from Le Petit Prince. The other tracks are also quite good, but were somewhat overlooked due to the massive sucess of the title track: "Crescendo" is very sentimental, and features a nice melody over a bubbling 303 acid line. "E-Volution", a very short acid workout. "Paradise Island" is more basic, but still enjoyable. Another exponent of musical legacy from this unforgettable label.